The Conservative Party’s proposal to increase the thresholds for strike votes isn’t about democracy—it’s about stifling unions. 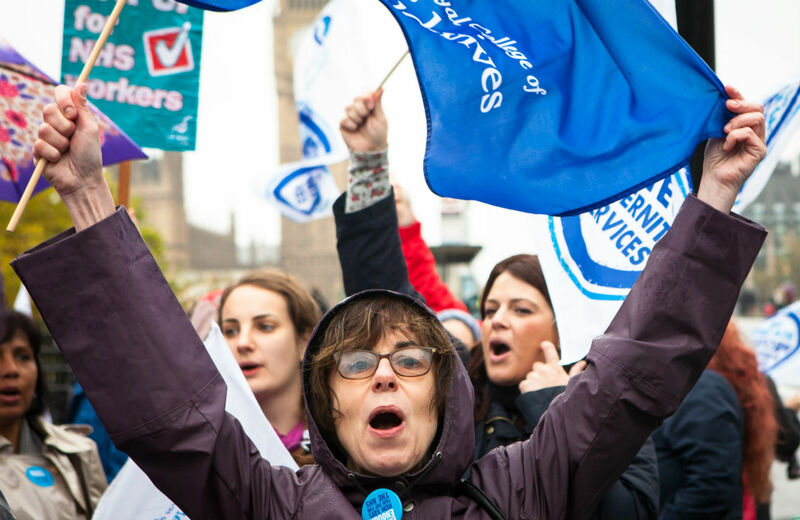 Meanwhile on the other side of the pond, the UK’s Conservative Party has proposed higher participation thresholds when it comes to unions voting on whether or not to strike, calling for a minimum level of approval from all eligible voters in public sector strikes. The Tories are pushing a 40 percent threshold on all strike votes in health, education, transport and fire services—so a vote for a strike would only count if four-in-ten of all eligible members voted. Under such a quorum rule, if there is even a unanimous vote to go on strike with a turnout of 39 percent of union members, the vote would be invalid. Proponents, who promote pro-austerity, pro-privatization agendas, complain that of “102 strike ballots between August 2010 and December 2014,” only about a third involved a majority of the workforce. Calls for a strike-vote threshold gathered steam last spring after a massive London Underground strike was authorized by a vote involving a minority of the workforce. Labor advocates see this as an effort to eviscerate public-sector unions as they struggle to battle deep budget cuts. Imagine if every local city council candidate needed 40 percent approval from all eligible voters, or school board elections required more than half of a district’s voters to cast votes? Even Congress routinely conducts business without reaching a formal majority quorum. Transport Secretary Patrick McLoughlin told BBC Radio that the proposal would ensure “that the rights of unions are balanced with the rights of hard-working taxpayers who rely on key public services.” The right-wing TaxPayers’ Alliance called it a protection for public services against “a minority of militant union activists,” according to The Telegraph. Trades Union Congress General Secretary Frances O’Grady sees a more pernicious form of minority rule at work by the 1 percent, stating that the voting requirement would “effectively end the right to strike in the public sector.” In contrast with the Tories’ populist overtures, O’Grady noted that a measure that could actually increase worker turnout, a secret online ballot, is opposed by the conservatives. Evidently, democracy is in the eye of the beholder. Shockingly, governments that have tighter strike vote rules aren’t exactly beacons of democracy themselves. So far as we are aware, unequivocally higher thresholds than those proposed by the Tories are to be found only in Bulgaria and Romania, where it is understood that the law permits industrial action only if it has the support of a majority of those eligible to vote (that it is to say 50 percent plus 1). The International Labour Organization has deemed the Bulgarian rule “inconsistent” with international law and urged reform. Similar union-voting rules were also pushed during Greece’s 2014 austerity frenzy by the (newly deposed) New Democracy party. Public sector strikes, while easy to paint as terribly inconvenient, are in fact all about the public interest. The labor conditions of public workers determine the quality of and access to public services all workers and taxpayers use and finance. Conservatives seek to persuade voters that public sector unions don’t represent workers but, rather, faceless parasitic bureaucrats (who also make convenient scapegoats for problems stemming from underfunding and mismanagement). This ideological canard encourages elements of the working class to cannibalize each other. But labor democracy should be seen as part of any functioning democracy, and workers’ representation through a collective body is very much part of any vital body politic. The harder it is for unions to vote for acts of resistance, the easier it is for bosses to silence all of us.